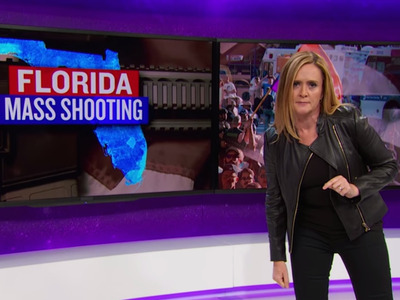 Samantha Bee was incensed after this weekend’s Orlando shooting. The “Full Frontal” host used her show to unleash her anger over America’s failure with gun legislation, the availability of the AR-15 rifle to civilians, and Florida governor Rick Scott’s response to the shooting in his state. Bee ditched the opening segment and the theme song to get right into the business at hand. “After a massacre, the standard operating procedure is that you stand onstage and deliver some well-meaning words about how we’ll get through this together, how love conquers hate. And that is great, that is beautiful, but you know what? F— it, I am too angry for that. Love does not win, unless we start loving each other enough to fix our problems,” Bee said. First she zeroed in on Omar Mateen, the man who entered Orlando’s Pulse nightclub and killed 49 people and injured 53 others, and the ease of his purchasing guns last week. After the attack, we learned he had been investigated and interviewed for possible terrorist connections, had a record of homophobic behaviour, and was violent with his wife.